For the ServiceAction field, add the following static lookup values. For ServiceListBox, add a dummy lookup value in case the preprocessor script doesn’t grab the desired data. Once added, you should see both custom fields listed like below. 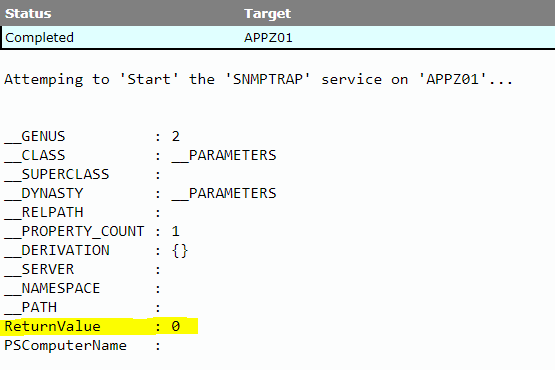 Next, save the following PowerShell snippet as PreprocessorSample.ps1. # Gather data and perform actions needed to populate custom tool fields. # For any other custom field data types, directly populate them like so: $dataBus.MyCustomTextField = "Here's my text"
# an array of one or more names will be present in the TargetHostname property of the databus. # Where  would retrieve the first and only computer name in the array. # be passed to the final custom tool code if selected by the user. # property is returned or selected. # the user running the custom tool to make some decisions before the form loads. # Be sure not to write any other data to the output stream. Add your new preprocessor script by going to Tools > Create Tool. Give it a name like “Preprocessor Example” and choose the Preprocessor category (this is important). Be sure to add permissions for roles that will need to run this tool. You’ll also want to explicitly map credentials for it, as this will be the context it runs under. Now, save the following PowerShell snippet as DynamicFieldSample.ps1. Write-Host "Attemping to '$Action' the '$ServiceName' service on '$ComputerName'..."
This is the main custom tool that a delegated user will run. Add it to System Frontier by going to Tools > Create Tool. 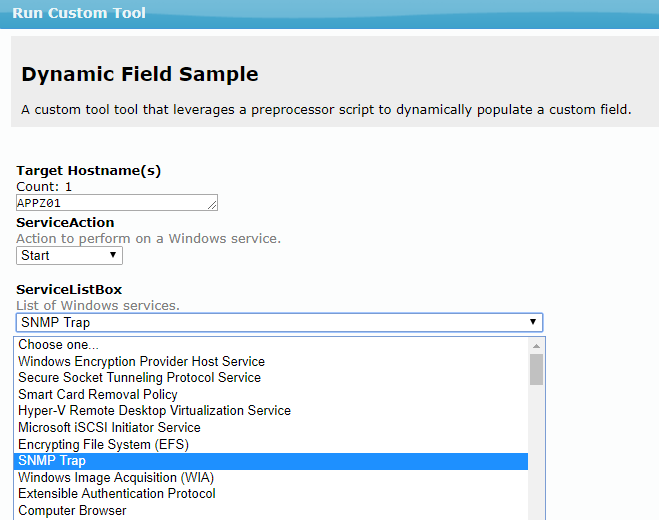 Name it “Dynamic Field Sample” and choose a meaningful category, but not Preprocessor. Click on the Modify button under User Input Fields, select the two custom fields you added earlier, click Add then Done to return to the tool configuration screen. Modify your Arguments section to capture the current hostname and user input fields in order to pass their values to the command-line of this tool. Under Preprocessor, choose the “Preprocessor Sample” script that you added earlier. Only custom tools with a category of Preprocessor will appear in this list. When you’re done, it should look similar to the screenshot below. The main tool calls the preprocessor tool, passing it information it needs like the list of target hostnames and custom fields. The preprocessor script performs it’s magic, updates all the data that was passed in a returns it to the main tool. The main tool then uses relevant data that was returned to populate custom fields before the web form is presented to the user. Notice the ServiceListBox field has the list of all Windows services that were returned by the preprocessor tool! The user makes choices or adds information, if needed and runs the tool. All values are passed to the command-line of your script and run under elevated credentials. 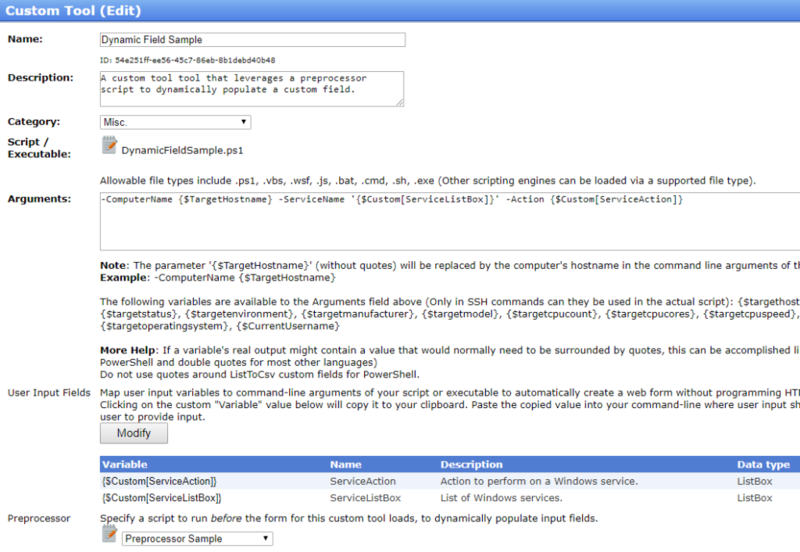 If designed correctly, preprocessor scripts and custom fields can be reusable and modular. All this without the need to write HTML or wire up Windows forms controls. Don’t forget, you can run custom tools on a list of hostnames, as long as they exist in SF, and the tool will automatically take advantage of multi-threading and parallel execution without additional code.